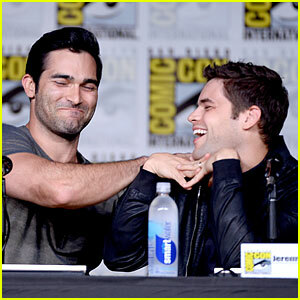 Jeremy Jordan jokes around with Tyler Hoechlin at the Supergirl panel during 2016 San Diego Comic-Con on Saturday (July 23) in San Diego, Calif. The two actors joined Melissa Beniost, David Harewood, Mehcad Brooks, and Chyler Leigh for the panel, where Tyler opened up about becoming Superman. “Definitely incredibly surreal. I know the character represents so much to so many people,” he said. FYI: Jeremy is wearing an AllSaints bomber jacket. Tom Holland waves to the packed crowd during the Spider-Man: Homecoming panel at 2016 San Diego Comic-Con on Saturday (July 23) in San Diego, Calif. The 20-year-old actor met up with his co-stars Zendaya, Tony Revolori, Jacob Batalon, and Laura Harrier, plus director Jon Watts for the event. Later on, Zendaya, Tom and the cast stopped by SiriusXM’s Entertainment Weekly Radio Channel at Hard Rock Hotel. FYI: Laura is wearing a Delfina Delettrez earring. Zendaya is wearing a Kenzo dress and Daya by Zendaya shoes. Michael B. Jordan & Lupita Nyong'o's 'Black Panther' Casting Officially Announced at Comic-Con! 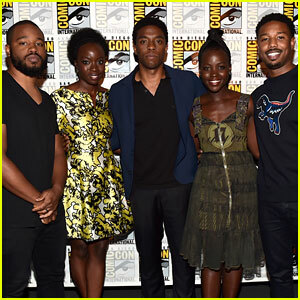 Danai Gurira, Chadwick Boseman, Lupita Nyong’o, and Chadwick Boseman pose for photos following the panel for Black Panther during 2016 Comic-Con on Saturday (July 23) in San Diego, Calif.
During the presentation, it was revealed that the Michael, Lupita, and Danai will be officially joining the cast! The three new actors join Chadwick, who will star as the Black Panther. Director Ryan Coogler also attended the panel. The appearance marked the group’s first official appearance together as a cast! Black Panther is set to hit theaters on July 6, 2018. FYI: Chadwick is wearing an Armani outfit and Christian Louboutin shoes. Lupita is wearing a Givenchy dress, shoes, and bag with APM Monaco jewelry. Danai is wearing an Oscar de la Renta dress.